You are browsing the archive for Open Knowledge Definition. One prevalent misdiagnosis is that the issue with Facebook and Google and the source of (much) of their monopoly power is to do with their control of our personal data. See, for example, the Economist’s cover in May 2017 showing Internet monopolies as oil rigs mining personal data – an allusion to the common assertion that “personal data is the new oil”. Increase compliance costs which burden less wealthy competitors disproportionately. In particular, increased compliance costs make it harder for new firms to enter the market. A classic example is the “right to be forgotten” which actually makes it harder for alternative search firms to compete with Google. Make it harder to get (permitted) access to user data on the platform and it is precisely (user-permitted) read/write access to a platform’s data that is the best chance for competition. In fact, it now gives monopolists the perfect excuse to deny such access: Facebook can now deny other competing firms (user-permitted) access to user data citing “privacy concerns”. Similarly, the idea sometimes put forward that we just need another open-source decentralized social network is completely implausible (even if run by Tim Berners-Lee*). Platforms/networks like Facebook tend to standardize: witness phone networks, postal networks, electricity networks and even the Internet. We don’t want lots of incompatible social networks. We want one open one — just like we have one open Internet. In addition, the idea that some open-source decentralized effort is going to take on an entrenched highly resourced monopoly on its own is ludicrous (the only hope would be if there was serious state assistance and regulation — just in the way that China got its own social networks by effectively excluding Facebook). Instead, in the case of Facebook we need to address the monopoly at root: networks like this will always tend to standardization. The solution is ensure that we get an open rather than closed, proprietary global social network — just like we got with the open Internet. Right now that would mean enforcing equal access rights to facebook API for competitors or, enforcing full open sourcing of key parts of the software and tech stack plus getting guarantees ongoing non-discriminatory API access. Even more importantly we need to prevent these kind of monopolies in future — we want to stop shutting the door after the horse has bolted! This means systematic funding of open protocols and platforms. By open i mean the software, algorithms and non-personal data are open. And we need to fund the innovators who create and develop these and the way to do that is replacing patents/copyright with remuneration rights. We’ve set out the basics of what open data means, so here we explore the Open Definition in more detail, including the importance of bulk access to open information, commercial use of open data, machine-readability, and what conditions can be imposed by a data provider. A key element of the definition is that commercial use of open data is allowed – there should be no restrictions on commercial or for-profit use of open data. In the full Open Definition, this is included as “No Discrimination Against Fields of Endeavor — The license must not restrict anyone from making use of the work in a specific field of endeavor. For example, it may not restrict the work from being used in a business, or from being used for genetic research.” The major intention of this clause is to prohibit license traps that prevent open material from being used commercially; we want commercial users to join our community, not feel excluded from it. 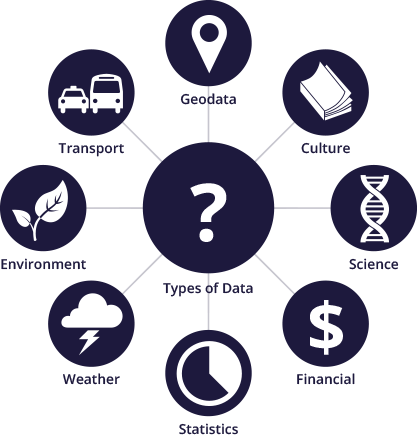 Attribution: an open data provider may require attribution (. that you credit them in an appropriate way). This can be important in allowing open data providers to receive credit for their work, and for downstream users to know where data came from. Integrity: an open data provider may require that a user of the data makes it clear if the data has been changed. This can be very relevant for governments, for example, who wish to ensure that people do not claim data is official if it has been modified. Share-alike: an open data provider may impose a share-alike licence, requiring that any new datasets created using their data are also shared as open data. Data can be provided in many ways, and this can have a significant impact on how easy it is to use it. The Open Definition requires that data be both machine-readable and available in “bulk” to help make sure it’s not too difficult to make useful. Data is machine-readable if it can be easily processed by a computer. This does not just mean that it’s digital, but that it is in a digital structure that is appropriate for the relevant processing. For example, consider a PDF document containing tables of data. These are digital, but computers will struggle to extract the information from the PDF (even though it is very human readable!). The equivalent tables in a format such as a spreadsheet would be machine-readable. Read more about machine-readability in the open data glossary. 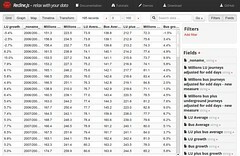 Data is available in bulk if you can download or access the whole dataset easily. It is not available in bulk if you are you limited to just getting parts of the dataset, for example, if you are restricted to getting just a few elements of the data at a time – imagine for example trying to access a dataset of all the towns in the world one country at a time. Bulk access allows you to build an API (if you want to!). If you need all the data, using an API to get it can be difficult or inefficient. For example, think about Twitter: using their API to download all the tweets would be very hard and slow. Thus, bulk access is the only way to guarantee full access to the data for everyone. Once bulk access is available, anyone else can build an API which will help others use the data. You can also use bulk data to create interesting new things such as search indexes and complex visualisations. Bulk access is significantly cheaper than providing an API. Today you can store gigabytes of data for less than a dollar a month; but running even a basic API can cost much more, and running a proper API that supports high demand can be very expensive. Generally, when we want to know whether a dataset is legally open, we check to see whether it is available under an open licence (or that it’s in the public domain by means of a “dedication”). However, it is important to note that it is not always clear whether there are any exclusive, intellectual-property-style rights in the data such as copyright or sui-generis database rights (for example, this may depend on your jurisdiction). You can read more about this complex issue in the Open Definition legal overview of rights in data. If there aren’t exclusive rights in the data, then it would automatically be in the public domain, and putting it online would be sufficient to make it open. However, since, this is an area where things are not very clear, it is generally recommended to apply an appropriate open license – that way if there are exclusive rights you’ve licensed them and if there aren’t any rights you’ve not done any harm (the data was already in the public domain!). In coming days we’ll post more on the theme of explaining openness, including the relationship of the Open Definition to specific sets of principles for openness – such as the Sunlight Foundation’s 10 principles and Tim Berners-Lee’s 5 star system, why having a shared and agreed definition of open data is so important, and how one can go about “doing open data”. Open data is data that can be freely used, shared and built-on by anyone, anywhere, for any purpose. 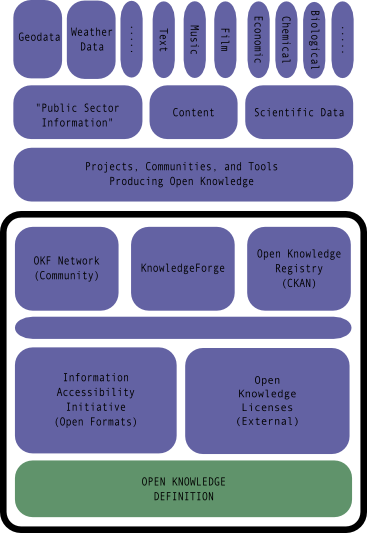 This is the summary of the full Open Definition which the Open Knowledge Foundation created in 2005 to provide both a succinct explanation and a detailed definition of open data. As the open data movement grows, and even more governments and organisations sign up to open data, it becomes ever more important that there is a clear and agreed definition for what “open data” means if we are to realise the full benefits of openness, and avoid the risks of creating incompatibility between projects and splintering the community. Open can apply to information from any source and about any topic. Anyone can release their data under an open licence for free use by and benefit to the public. Although we may think mostly about government and public sector bodies releasing public information such as budgets or maps, or researchers sharing their results data and publications, any organisation can open information (corporations, universities, NGOs, startups, charities, community groups and individuals). There is open information in transport, science, products, education, sustainability, maps, legislation, libraries, economics, culture, development, business, design, finance …. So the explanation of what open means applies to all of these information sources and types. Open may also apply both to data – big data and small data – or to content, like images, text and music! So here we set out clearly what open means, and why this agreed definition is vital for us to collaborate, share and scale as open data and open content grow and reach new communities. Legal openness: you must be allowed to get the data legally, to build on it, and to share it. Legal openness is usually provided by applying an appropriate (open) license which allows for free access to and reuse of the data, or by placing data into the public domain. Technical openness: there should be no technical barriers to using that data. For example, providing data as printouts on paper (or as tables in PDF documents) makes the information extremely difficult to work with. 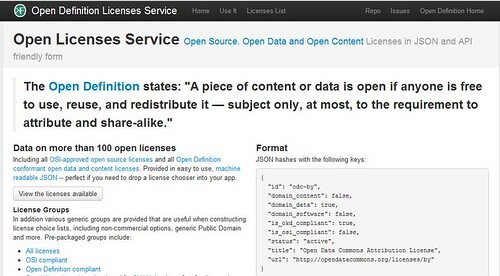 So the Open Definition has various requirements for “technical openness,” such as requiring that data be machine readable and available in bulk. Since 2007, the Open Definition has been governed by an Advisory Council. This is the group formally responsible for maintaining and developing the Definition and associated material. Its mission is to take forward Open Definition work for the general benefit of the open knowledge community, and it has specific responsibility for deciding on what licences comply with the Open Definition. The Council is a community-run body. New members of the Council can be appointed at any time by agreement of the existing members of the Advisory Council, and are selected for demonstrated knowledge and competence in the areas of work of the Council. The Advisory Council operates in the open and anyone can join the mailing list. The Open Definition was created in 2005 by the Open Knowledge Foundation with input from many people. The Definition was based directly on the Open Source Definition from the Open Source Initiative and we were able to reuse most of these well-established principles and practices that the free and open source community had developed for software, and apply them to data and content. Thanks to the efforts of many translators in the community, the Open Definition is available in 30+ languages. In coming days we’ll post more on the theme of explaining openness, including a more detailed exploration of the Open Definition, the relationship of the Open Definition to specific sets of principles for openness – such as the Sunlight Foundation’s 10 principles and Tim Berners-Lee’s 5 star system, why having a shared and agreed definition of open data is so important, and how one can go about “doing open data”. Andrew Stott, Former Director for Transparency and Digital Engagement and Co-Chair of the Open Government Data Working Group at the Open Knowledge Foundation. Open movements will continue to grow rapidly (unless we fail miserably). You can help ensure we succeed splendidly! We could always use more help reviewing and providing feedback on licenses, but there are also roles for designers, programmers, translators, writers, and people committed to sound open strategy. See a recent get involved update for more. Most of all, make sure your open access / culture / education / government / science project is truly open — OpenDefinition.org is a good place for you and your colleagues to start! Today we’re no longer at the beginning of this worldwide campaign, and not yet at the end. We’re solidly in the middle, and draw upon a decade of experience in order to make new recommendations for the next ten years. We reaffirm the BOAI “statement of principle,…statement of strategy, and…statement of commitment.” We reaffirm the aspiration to achieve this “unprecedented public good” and to “accelerate research, enrich education, share the learning of the rich with the poor and the poor with the rich, make this literature as useful as it can be, and lay the foundation for uniting humanity in a common intellectual conversation and quest for knowledge.” We reaffirm our confidence that “the goal is attainable and not merely preferable or utopian.” Nothing from the last ten years has made the goal less attainable. On the contrary, OA is well-established and growing in every field. We have more than a decade’s worth of practical wisdom on how to implement OA. The technical, economic, and legal feasibility of OA are well-tested and well-documented. Nothing in the last ten years makes OA less necessary or less opportune. On the contrary, it remains the case that “scientists and scholars…publish the fruits of their research in scholarly journals without payment” and “without expectation of payment.” In addition, scholars typically participate in peer review as referees and editors without expectation of payment. Yet more often than not, access barriers to peer-reviewed research literature remain firmly in place, for the benefit of intermediaries rather than authors, referees, or editors, and at the expense of research, researchers, and research institutions. Finally, nothing from the last ten years suggests that the goal is less valuable or worth attaining. On the contrary, the imperative to make knowledge available to everyone who can make use of it, apply it, or build on it is more pressing than ever. 2.1. We recommend CC-BY or an equivalent license as the optimal license for the publication, distribution, use, and reuse of scholarly work. 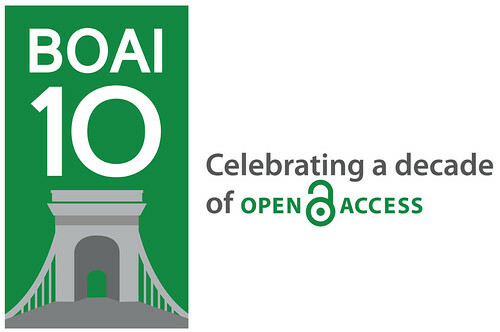 OA repositories typically depend on permissions from others, such as authors or publishers, and are rarely in a position to require open licenses. However, policy makers in a position to direct deposits into repositories should require open licenses, preferably CC-BY, when they can. OA journals are always in a position to require open licenses, yet most of them do not yet take advantage of the opportunity. We recommend CC-BY for all OA journals. In developing strategy and setting priorities, we recognize that gratis access is better than priced access, libre access is better than gratis access, and libre under CC-BY or the equivalent is better than libre under more restrictive open licenses. We should achieve what we can when we can. We should not delay achieving gratis in order to achieve libre, and we should not stop with gratis when we can achieve libre. The worldwide campaign for OA to research articles should work more closely with the worldwide campaigns for OA to books, theses and dissertations, research data, government data, educational resources, and source code. If you’re interested in finding out more about the Open Knowledge Foundation’s open access activities you can join our open-access mailing list. OpenDefinition.org – the Open Definition, the underlying principle behind everything that we do. DataHub.io – we mentioned when explaining how we ourselves show the steps when working with data, to ensure that anyone can track and replicate our working. Licensing questions. We were delighted to hear that some of the NGOs present in the workshop were considering openly licensing some of the data they had collected themselves and wanted to know which licence to pick. There are still lots of grey areas to iron out where derivative works from government data is concerned; for example, Transparent Chennai were not sure whether they could release government datasets to which they had added geographic markers under an open licence. For this type of question, our recommendation would be to drop the community of experts and lawyers a message via the Open Definition discussion list. Oh, and yes, we were glad we came (very!). Thank you Nithya for the invite, and we look forward to hearing a lot more from Transparent Chennai! 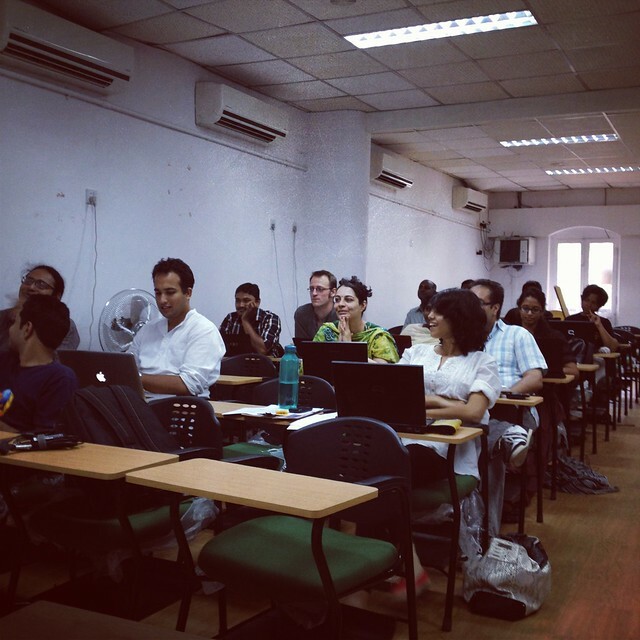 Next stop in the Open Data in India series – Mumbai. Specially selected set developed for CKAN that is perfect for data and content site license choosers. The source for all this material is a git licenses repo on github. Not only does it provide another way to get the data, but also means that if you spot an error, or have a suggestion for an improvement, you can file an issue on the Github repo or fork, patch and submit a pull request. The first reason is the most obvious: having a place to record license data in a machine readable way, especially for open licenses (i.e. for content and data those conforming to the Open Defnition and for Software the Open Source Definition). The second reason is to make it easier for other people to include license info into their own apps and services. Literally daily, new sites and services are being created that allow users to share or create content and data. But when they do that, if there’s any intention for that data to get used and reused by others it’s essential that the material get licensed — and preferably, openly licensed. By providing license data in a simple machine-usable, web friendly format we hope to make it easier for people to integrate license choosers — and good license defaults — into their sites. This will provide not only greater clarify, but also, more open content and data — remember, no license usually means defaulting to the most restrictive, all rights reserved, condition. The definition has now been translated into 27 languages. If you’d like to translate the Definition into another language, or if you’ve already done so, please get in touch on our discuss list, or on info at okfn dot org. 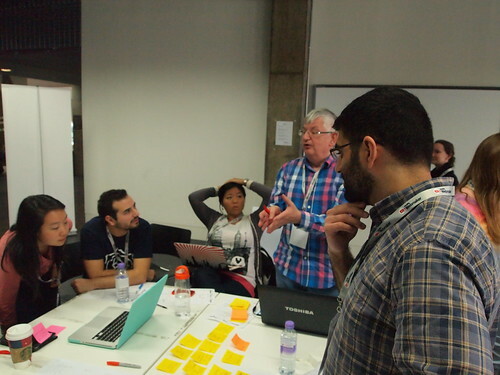 This post is from Lucy Chambers, Community Coordinator at the Open Knowledge Foundation. Earlier this month, the UK Government published the ‘Open Data Consultation Paper’. Its aim is to establish a “culture of openness and transparency in public services” and the Government is turning to the general public for their preferences on how this should be achieved. This is an incredibly important opportunity to influence government policy on open data. So if you care about open data – make sure to make your voice heard! Our proposed approach is, fundamentally, about creating both „pull‟ (a right to data) and „push‟ (a presumption of publication). With these forces, we will begin to embed openness and transparency in how we run government. This consultation seeks your views on these ideas. how far there is a role for government to stimulate enterprise and market making in the use of open data.